We revisit a favorite topic, this time with some tangible insight and practical, day-to-day tips. We talk about breaking down pursuits into individual components to be able to find new learning resources and why most people don’t want to do Deliberate Practice. You’ll hear advice on how to get seasoned artists and professionals to give you high quality critiques, and exactly what to do to find the things you should be working on. You can read tutorials all day, but you’ll only improve by doing. 05:27 Some introductory notes on starting with the content and then tailoring it to the medium as opposed to letting the medium dictate your message. Practice: Playing 1-on-1 basketball with your buddy. Deliberate Practice: Shooting 100 free throws. 13:08 Yes, you’re going to improve a little bit by playing some 1-on-1, but it’s not very intentional practice. 13:16 Repetitious and purposeful practice of specific techniques is what is going to train your muscles and train your mind. 14:53 Doing your normal work is not deliberate practice. 14:59 Deliberate Practice is a separate act from your main work that is focused on bettering one specific aspect of what you do. 15:07 A lot of people think going about their day doing their normal work is practice. It’s not. 15:16 If you want to intentionally get better, you need deliberate practice. The key here is objective-oriented. It’s set aside time to specifically improve individual facets of your trade. Write down the things you notice. Maybe it’s not necessarily that something is wrong or it’s a problem, but maybe you just know you want to get better at it. Write that thing down. If other people give critiques or suggestions, write down what other people notice. 17:08 You have to set aside time for your Deliberate Practice. You already have your work time, but you need to set aside separate time to work on these things if you really want to get better on purpose. 17:29 So you’ve set aside time for your Deliberate Practice, and you’re at your desk ready to improve. Now what? Now pick one of those things you wrote down, and start doing lots of them. Hundreds. Put on a podcast or some music to help make it feel less monotonous. 17:44 You want to work at this thing over and over and over. Again, training your muscles and training your mind. You’re only going to get better by doing, not by reading other people’s blogs, books, or tutorials. By doing. 19:55 You have to practice the fundamentals over and over. Practicing scales on the piano is what allows you to effortlessly glide over the keys during parts in a song that call for a chromatic run. 22:48 Go to someone who is good at what you want to do and ask them for feedback on your work with absolutely no buttering up. Find someone to give you uncensored feedback on what you can improve—no compliments allowed. 26:55 You need to be practicing 6 months daily at a MINIMUM before you go seeking help from a seasoned artist. Otherwise, you’re just wasting their time and valuable insight, and that’s just disrespectful. 27:03 Put in the time, and then make it incredibly easy for this person you’re soliciting feedback from. Make it clear that you’re not looking for any fluff or nonsense. You’re not going to get better from people telling you what you did a good job on. 28:15 The best advice I can give is not to wait until you find something that will hold your hand through every step, but be proactive about bettering yourself in many specific areas. 28:29 Break what you’re pursuing down into a bunch of individual components and research and practice every one of those individually. Spend an entire session of your deliberate practice getting better at that one thing. 28:53 Some examples of how you might break down a pursuit into individual components to get your mind working. 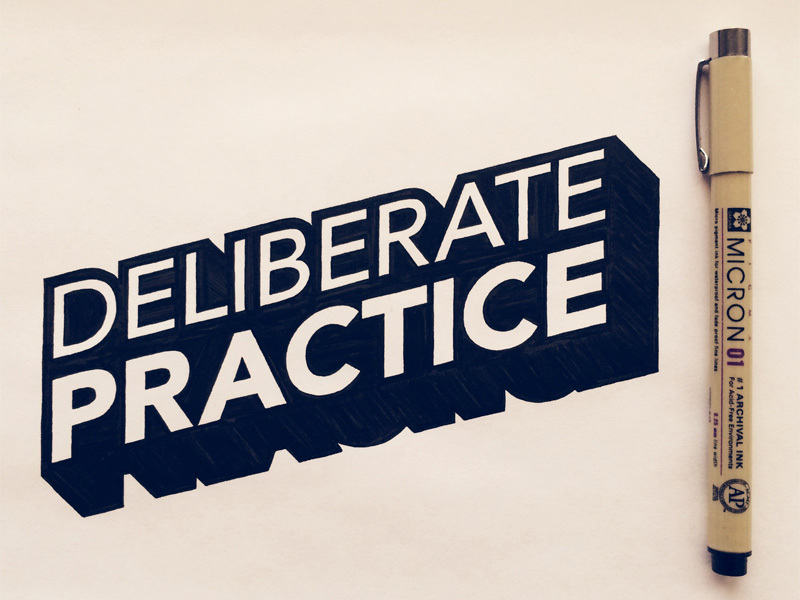 Why we don’t want to do deliberate practice? 35:12 The bottom line is because it isn’t as fun. 35:22 Which is cooler? Practicing your piano scales or showing off at a party by playing a popular song? Everyone wants to be able to play a song, the scales are much less glorious. 35:36 With lettering, which gets more likes on Instagram? A full quote piece or a bunch of repeated letters? The same with illustration. No one wants to focus on perfecting their shapes and proportions, they just want to draw the fully finished illustration, because it gives you this sense of accomplishment. 35:57 Well yes, you finished something, but what is your goal? Is it that you want that little shot of dopamine you get from continually posting your fully completed pieces? Or do you actually want to get better, faster, and on purpose?